The boat is fast and the seas are often very rough. In the front rows, it’s the thrill of being on a roller coaster. The waves hurl you up and land you with a thump. From the middle rows to the back it is a more sedate ride – depending on the weather. So you get to choose what sort of ride you want, according to where you sit. But wherever you sit, the views of the south-eastern Tasmanian coastline are spectacular. 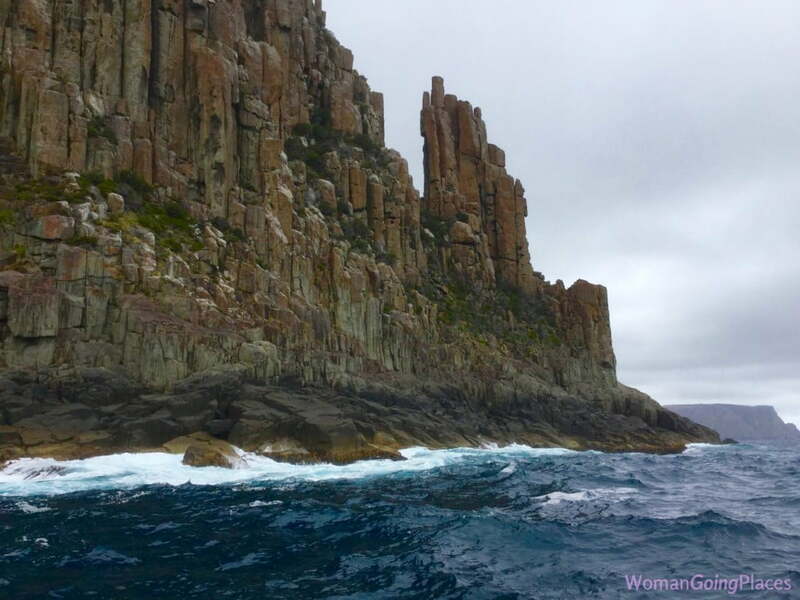 WomanGoingPlaces was on the Tasman Island Cruise of Pennicott Wilderness Journeys. Everyone in the boat was feeling exhilarated and filled with delight at the formidable beauty of the cliffs. But suddenly, I was able to envisage how these same cliffs would have appeared to someone, 200 years ago. These cliffs would have been the first things the convicts from England saw of their penal colony of Van Diemen’s Land (Tasmania) where they would begin years, if not a lifetime of servitude. 300 metres, the highest in the southern hemisphere. Grey, barren, dolerite rock compressed over 290 million years into narrow vertical pleats – frightening to their eyes, geological wonders to ours. Our boat manoeuvres below archways, into deep sea caves and past blow holes and waterfalls. It floats beside platforms of rocks where countless nonchalant seals lie sprawled just above the waterline, eyeing us with different levels of interest. And then there is the wonderful feeling of freedom as we skim from one sea to another and back – from the Tasman Sea to the Southern Ocean that surrounds Antartica. We had begun the tour with a bus trip from Hobart. As we passed through Eaglehawk Neck to Port Arthur, the driver told us about the infamous dog-line. In the 1800s, starving, savage dogs had been stationed along this narrow strip of land to attack convicts trying to escape from the nearby penal colony at Port Arthur to the mainland of Tasmania. We alighted at a jetty and were fitted out with red waterproof jackets. We then boarded a sleek eco-cruiser, one of the Pennicott’s fleet of vessels customised to suit the rugged south Tasmanian coast. These open-sided rigid inflatable craft are 12.5 metres long with tiered seating for 43 passengers. As we head out to sea, albatross circle close above our heads. Gannets, shearwaters, terns and fairy prions sweep over the waves. Sea eagles and falcons keep watch at the tops of the cliffs. Dolphins accompany the boat, but it is the wrong season to see migrating whales. This coastline and the abundant marine life and seabirds are all part of the Tasman National Park. The variety of wildlife, the extraordinary beauty of the coastline, and the thrill of speeding over the water from one stunning area to another, made this the most marvellous experience. This cruise, and the cruise to Bruny Island that Pennicott Wilderness Journeys also operates, have won multiple tourism awards.